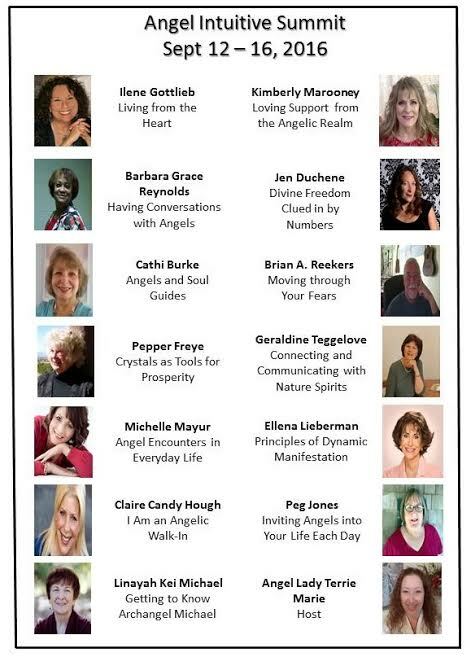 I’m so excited to be a featured guest speaker on the Angel Intuitive Summit hosted by my friend, Angel Lady Terrie Marie and it starts in just a few days. There are 14 Intuitives who are coming together to share their expertise, techniques and tips with everyone who chooses to join us for this life-changing journey. Terrie Marie has been working on this virtual summit for several months to create a special, Sacred environment to help as many women and men just like you and me around the world, so they can fulfill their life purpose without all the negative self-sabotage that gets in the way. This is what we’ll be speaking about. ​﻿The best part is, it’s FREE to register and you’ll get a Guidebook that has a special “Bonus Tip” from all 14 Guest Intuitives just for registering. The way Angel Lady Terrie Marie has set this virtual summit up is a little different because each Guest Intuitive segment is live and we’ll all be taking LIVE calls, answering questions from callers live on the air! I’d love for you to join us. Your voice needs to be heard more now than evert before and who knows, maybe one day we’ll be sharing the virtual stage together! “See” you at the summit. It starts in just a few days. That’s September 12th through September 16th , 5 days of life-changing “no fluff” content that can help catapult you to fulfilling your Divine Life Purpose with prosperity and abundance. You can also upgrade to the Gold Upgrade Package!